The main body of the structure consists of reinforced concrete columns and sections in accordance with the structural design of the project creating a compact building, with high quality armor making the building earthquake-resistant. 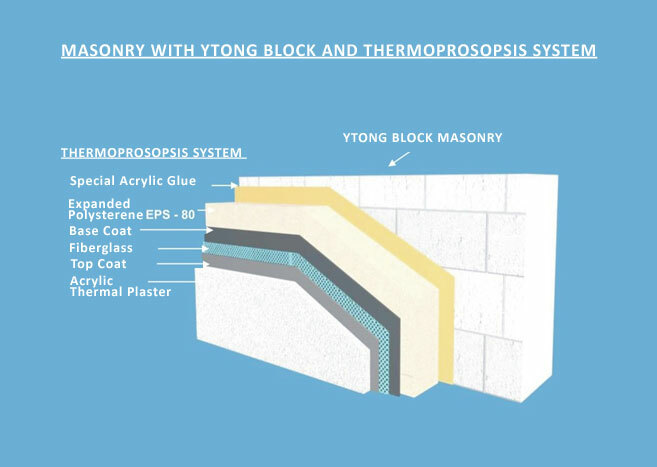 THERMAL INSULATION: The cellular composition of YTONG BLOCK gives the material very well insulated base which meets the Directive on Energy Performance of Buildings Directive (2002/91/EC) issued by the European parliament. With YTONG BLOCK avoid the airlifts achieving excellent indicators of thermal shielding for the building from the temperature changes by a thermal factor of K <0,6 kcal/m2hoc. SOUND INSULATION: The surface of YTONG BLOCK masonry absorbs noise in partially open cells, achieving maximum level of sound insulation. IMPROVED FIRE SAFETY: The YTONG BLOCK has excellent reaction to fire and is ideal for fire protection because it is non-flammable. EARTHQUAKE RESISTANCE – LIGHTWEIGHT STRUCTURAL MATERIALS: Using YTONG BLOCK adds small loads on the structure so that it has the same behavior in the event of an earthquake. A 20cm YTONG BLOCK masonry weighs only 120kg/m2 while the corresponding conventional weighs 360kg/m2. ENVIRONMENT FRIENDLY: YTONG BLOCK is friendly to humans and the environment to safeguard the environmental management system ISO 14:001. 1. The elimination of thermal bridges (places where insulating material is interrupted) to the contact points of the beams and columns with masonry . 2. Ensures reduction of energy consumption in the winter and summer by 45-60 %. 3. Enhances the thermal comfort of the space as well as the life quality of its residents. 4. Maintains constant temperature of the interior spaces for longer after stopping the heating and cooling and increases the temperature difference between inside and the outside of the construction.